These show notes contain affiliate links. When you click through and make a purchase, SewHere receives a commission at no cost to you. 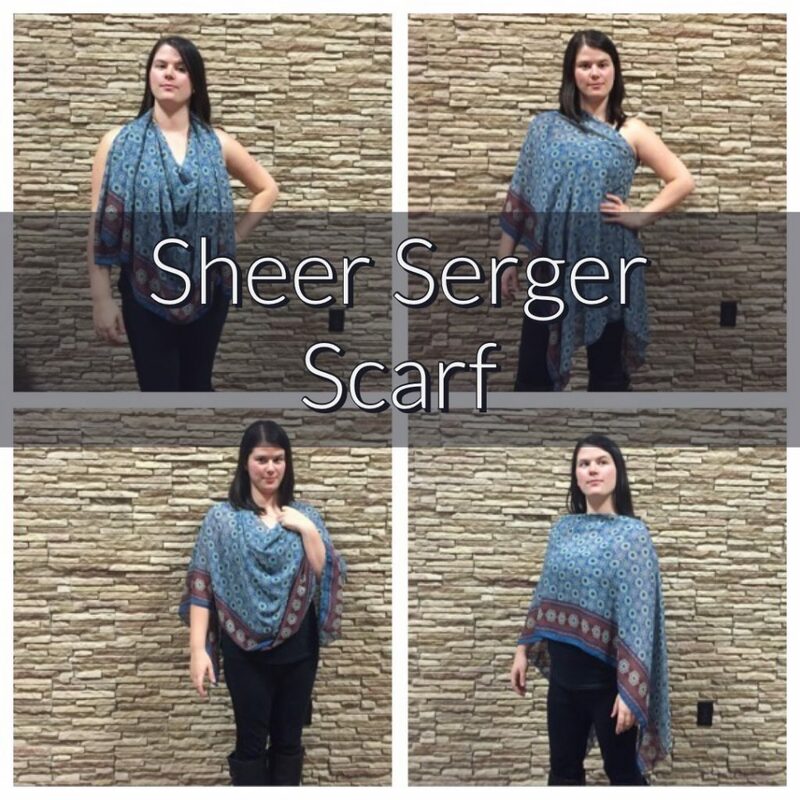 Happy National Serger Month! It’s always Serger Month in our hearts, but Baby Lock celebrates it in April. 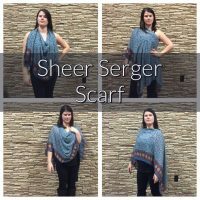 The sheer serger scarf is a quick and easy gift that you can make last minute and really wow the recipient! Video available on YouTube and on our website! This scarf can be as formal or casual as you wish. We highlight the use of sheer fabrics in the video, but a lot of people make knit version as nursing covers. Another plus? One size fits all! You can use the measurements and guidelines in this video for just about anyone. So, rest assured that it will fit your gift recipient. You need 2 yards of fabric. This project shows off fabrics- so if you have some gorgeous border print, use it here! Anything that drapes nicely will work; lace, crepe, velvet, burnout velvet, chiffons- have fun! This is a great reason to look in the remnant bin or a wonderful way to show off hand dyed yardage. Cut the 2 yards in half lengthwise, so that you have a piece of fabric that is 72″x 1/2 the width of the fabric. You can theoretically piece together two 1 yard pieces, but the scarf will not lay as nicely. Fold the Fabric in half, short edges together. The selvage edges should lay on top of one another, and the cut edges should lay on top of one another. With two pins or clips, mark 15″ from the halfway point on both cut edges of your fabric. Don’t pint he layers together, mark them separately. 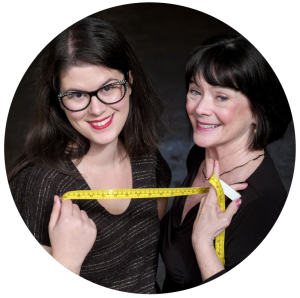 This is your neckline, it’s a total of 30″ around- which will go around almost anyone’s head. This scarf is constructed completely with the 3-thread rolled edge. This is appropriate for a sheer fabric. If you use a different type of fabric, you may want to modify, but you can still use the basic construction outline here. The rolled edge is durable enough for a seam on this project, because there’s not a lot of stress on the seam. Baby Lock sergers make gorgeous stitches with little need to modify settings or tensions. When you figure out your rolled edge on a Baby Lock, the only thing you should have to change is the stitch length, and this is up to you! You want to get the right amount of coverage and flexibility. If your stitch is too long, you can get “pokeys” where the threads of the fabric poke out of the hem. If the stitch is too short, the serger thread can build up and create a very stiff edge. There’s no real right or wrong way, and every fabric will react differently- so test on some scraps. I test a 2mm, 1mm, and a 4mm in the video- and I ultimately decide the 2 mm is the best look for my scarf. We use polyester machine embroidery thread in our serger for this project. It’s durable, yet lightweight and it comes in a ton of colors. Place your long cut edge underneath the serger presser foot so that you serge between your pins- so you’re starting in the middle of the fabric. Always have your blade on while doing a 3 thread rolled edge. You need to give your machine the right amount of fabric to cut, roll and stitch in the rolled edge. Now you have a raw-edge hem and the selvage edge hem. Finish these in any order, but when you do your second hem, leave 6 inch-long tails along the edges- don’t clip them! Make sure to cut off enough fabric, so that you enclose the previous hem. don’t let the presser foot push the hemmed edge away. In the video, I cut the selvage edge quite a bit to get rid of the loom prick marks. After you’re finished sewing, thread beads on to the serger tails to finish the scarf and to weight it down. It’s best to use a heavier bead, or even a charm. I use some beads int he video that are probably too small to be effective- but it was a last-minute production! Malibu or Marabou? Who knows? Who cares? Wigs: We mention that someone thinks Zede is wearing a bad wig in one of our YouTube videos (which is rude, because who cares if someone is wearing a wig, and Zede would buy good wigs if she did have to wear a wig). Then we talk about how maybe you’d want to make the head opening larger if you were wearing a Marie Antoinette wig on drag night- and it just so happens that my good friend created the most awesome Marie Antoinette drag look- so I have to share it! Find X-Ray images of Balenciaga gowns here.